I would prefer to chat about Jesus, the King of all kings and Lord of all lords, than about the defeated one. There was a little incident this week that made me chuckle, reminding me Satan is nothing more than a roaring lion, a barking dog or a buzzing bee. As a child I would veer off the road to uncharted paths; now I often walk the back allies of the place I call home. At one particular spot, a high chain link fence confines two dogs. Inevitably with jaws flapping, they bolt full tilt at every passer-by, dashing back and forth within their confinement. Their predictable path behind the fence trampled. Usually I ignore them. Today I did not! I stood still maintaining absolute eye contact with the lead dog. He continued his aggressive barking, pacing his restricted ground. I stayed quietly staring him down. He stopped directly in front of me barking intensely, then continued his back-forth run. Finally he slinked behind the hedging. Peering through the leaves, he was waiting for me to blink. Blink? Not a chance! Again he picked up his pattern of intimidation. Again he stopped, this time directly in front of me. He flinched looking away – to the side, to the sky, behind him, above me… Feebly he barked; quickly he stopped. Then with head hung low slowly he headed back to the place he came from, almost looking over his shoulder, but not quite…. Inwardly I chuckled! One more dog stared down! You see I know where I stand! I am standing and walking in the free zone. The dog is bound by a fence! I have liberty. He does not! As a Christian does this make sense? Through the cross of Christ the enemy was debilitated and publicly humiliated. One more note! When Christ was raised from the dead, we were raised victorious IN HIM! This is our reality! We are the ones who walk in freedom, power and authority! Yes, scripture says Satan is like a roaring lion looking for someone to “devour”. We don’t need to cower (crouch down in fear). The same passage in I Peter 5 gives instruction. Eyeball him down, friends! Eyeball him down! and my true position in Christ. 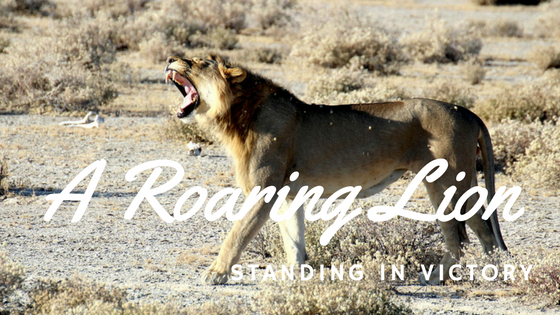 Next time you hear the lion roar, a dog barking or a bee buzzing around your head, I hope you stop in your tracks. Then take a look around at the true freedom you have in Christ. Stare that noisy intruder down moving forward rejoicing in the power of the cross and resurrection over you. Don’t forget to grin a little as you do it! the cross and the resurrection. Feel free to comment on this or any other post. Blessings! ← Nothing is Impossible – With God Your Problem is God’s Opportunity!